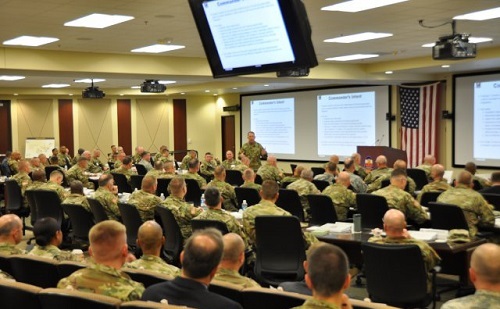 JUNE 1, 2016, FORT BRAGG, N.C. – Key leaders of the Total Army Force focused, May 25-26, on the details and design concepts behind the U.S. Army’s Associated Units program in a pilot-implementation forum. 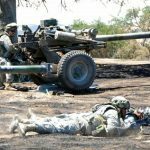 The forum focused on the initial steps for training, manning, equipping, leading and maintaining the vital readiness for key active Army, Army National Guard and Army Reserve units in nine states and even Italy. “This is a first, to have all the command teams associated with this pilot implementation all in one room at one time,” said Gen. Robert B. Abrams, U.S. Army Forces Command commanding general. “The requirements that the Army has … are going to require all 980,000 Soldiers to be ready to go: about 450,000 in the active component, 335,000 in the National Guard and 195,000 in the Army Reserve to meet all the requirements, plus all the steady-state operations in the world, and to be able to sustain it over the lifespan of a campaign. The day and one-half pilot implementation forum focused on the formal relationships for readiness, equipping and training within the three Army components, as well as scheduling and leveraging Army Combat Training Center rotations at the National Training Center and Fort Irwin, Calif.; the Joint Readiness Training Center at Fort Polk, La., regional and overseas military-training facilities, and the vital Army Total Force Policy training role of First U.S. Army. The forum also addressed more detailed issues — such as possible common uniform patches for the Army associated units, important budget considerations, and personnel exchanges among them and leader-development priorities. About 180 Army leaders attended the first-of-its-kind event — including 72 representatives of the Army National Guard, Air Guard and U.S. Army Reserve, as well as representatives from U.S. Army Pacific and U.S. Army Europe. 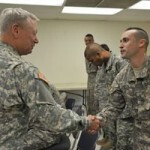 The initial three-year pilot-implementation for Associated Units is summer 2016 through 2019 and includes 13 Army units from active, Army National Guard and Army Reserve forces. Army units involved in the pilot include forces in Hawaii, Indiana, Missouri, New York, Oklahoma Tennessee, Texas, Vermont and Georgia. The planned association of Georgia-based units will be the first of the Associated Units. 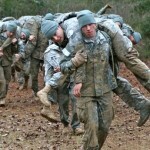 This summer, Task Force 1-28 Infantry, an Active Army infantry battalion stationed on Fort Benning, Georgia, is being associated with the 48th Infantry Brigade Combat Team, a Georgia Army National Guard unit. The 48th Infantry Brigade, meanwhile, is being associated with the Active Component’s 3rd Infantry Division, stationed on Fort Stewart, Georgia.